Think Aloud is a strategy that scaffolds students’ interactions with print. I’ve been reading about this strategy and have included using this strategy in writing sessions – Interactive, Shared and Modelled. When modelling my journal, I’m making my thinking process very explicit. Articulating the strategies I’m using, resources that are helping me and the constant ‘read back & check’ process. This has definitely increased my students’ use of these strategies. During Student Led Interactive Writing, I roam for part of the session listening to conversations and prompting when necessary. It’s wonderful to see these very young children sharing their thinking strategies aloud with their group. Think Aloud – its original purpose. making, confirming and revising predictions based on information in the text. There are a number of steps to doing this process formally. At present, I am modelling ‘Think Aloud’ when reading to my students. I’m also modelling ‘Think Aloud’ when we’re doing Modelled and Shared writing and children are starting to use ‘Think Aloud’ during Student Led Interactive Writing. Apart from verbalising their understanding and the strategies they are using for all to listen, they are also ‘thinking about their thinking’. I asked my students if they were learning more and they felt they were. My observations support greater engagement levels when using Think Aloud’. They are definitely active listeners when their peer is thinking aloud. 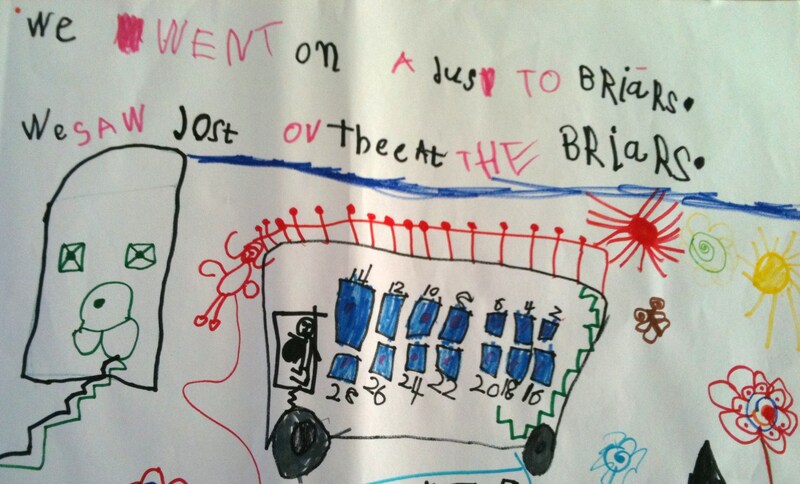 We went on a bus to the Briars. We saw lots of things at the Briars. We have started THRASS this year and I’m struggling with it as I can’t quite get rid of how I’ve been teaching for many years. My children are referring to the chart and one child spelt ‘things’ by using ‘th’ as in thumb (I think it was thumb) and ‘ing’ as in king and then added an ‘s’. Probably no quite the THRASS way but still very clever. I’m using a number of strategies as I learn THRASS. One of my 5 year olds has learnt the charts, so I have my helper. Unfortunately, we often spend time looking for words that aren’t on the chart, so I’m adding to the charts as we go. Even after two days training I still find myself lost.